Twitter sometimes gets it first -- whether the recent death of Whitney Houston, Hudson River plane crash, or the 2008 terror attacks in Mumbai. Despite being an important part of the news cycle, Twitter and Facebook, are still not big news sources for most people, a study reveals. Just 9 percent of American adults turn to Facebook and Twitter on a regular basis for news, according to The State of The News Media 2012, a report from the Pew Research Center's Project for Excellence in Journalism. Instead of looking to their family, friends, acquaintances, and colleagues, most people still get their information from news organizations (36 percent), search engines (32 percent) and news aggregation sites and apps such as Google News and Flipboard (29 percent), the Pew study finds. Not surprisingly, those numbers change when you exclude non-digital news consumers and count only people who go online for their primary or only news sources. 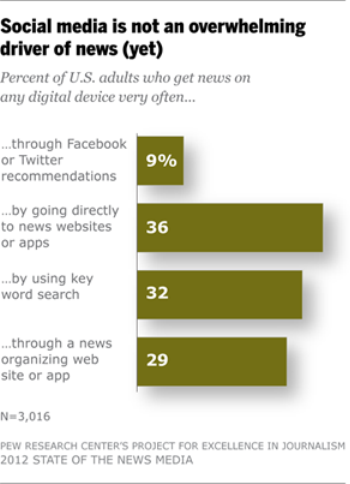 More than half -- 52 percent -- of those digital news consumers get at least some news from Facebook and Twitter. But digital news readers still prefer to get their data directly from news organizations (92 percent) and search engines (85 percent). Despite Twitter's reputation for breaking news, it appears that Facebook is where people are most likely to turn to get news recommendations. Seven percent of U.S. digital news consumers say they get news on Facebook very often, the Pew's survey finds, while 3 percent turn to Twitter with the same frequency. 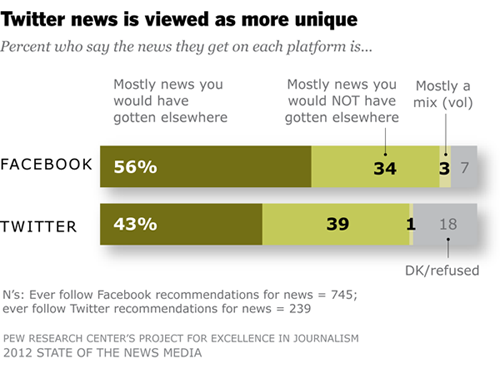 But Twitter appears to be a more highly valued news source than Facebook. More than half -- 56 percent -- of Facebook users who get news from links on the social network say they would have found that news somewhere else. Only 43 percent of Twitter users, by comparison, felt the same way about links they find through the self-styled "information network." It will be interesting to see if these findings change over the next few years, especially where Facebook is concerned. The world's largest social network is encouraging news sites to create apps using Facebook's new frictionless sharing apps that automatically share what users are reading with their friends. If you're a Facebook user, you've likely seen a lot of these links pop up on your news feed showing you that a friend has read an article from Yahoo News, The Wall Street Journal, The Washington Post, The Guardian, or other news sources. Given the viral nature of Facebook and the seamless way people are now sharing news on the social network, the importance of Facebook as a news driver could change dramatically over the next twelve months. The Pew's findings are based on responses from 3016 U.S. adults surveyed during the month of January.